This article details the measurement of distance using light, with a focus on structured light. 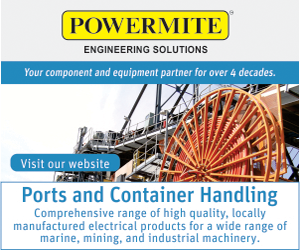 Assessing the distance, size, or shape of objects is of great practical importance in myriad applications. While some distance measuring methods can be found in nature, others have been generated by humans for improved accuracy. Stereoscopic vision is the main mechanism for humans and other organisms to obtain this information nearly instantaneously, the accuracy of which depends on many variables. These include the distance to the target; the target’s intrinsic size, shape, or colour, and the functionality of the light detectors – in our case, eyes. The eyes receive light from the surroundings, producing retinal images which the brain processes. This is a passive method of distance measurement. An example of an active method, though not optical, is echolocation by bats. The bat emits a short burst of sound; the sound reflects from a target (echo) and is later detected by the bat’s ears. The time interval between the emission and reception gives clues about the distance. When it comes to measuring distance with light, there are no examples found in nature because the speed of light is close to a million times higher than the speed of sound, which means that, for a given distance, the time-of-flight (ToF) for a light pulse is about one-millionth of that for sound. Nature has not developed clocks capable of measuring time intervals this short, but humans have. An accurate and quantitative determination of distance using light has many practical applications in modern life. Point-by-point measurements can produce 3D imagery, important in map making (distances in kilometers), assembly line quality control (distances in the order of meters), or microscopy (distances in the order of micrometers). Numerous active and passive techniques have been developed to obtain 3D imagery, but a given method will belong to one of three main techniques: geometrical, ToF, or interferometry (see Fig. 1). Fig. 1: Flow chart of the techniques of measuring distance. A geometrical technique such as triangulation relies on the spatial geometry between the source of light, target, and detector. 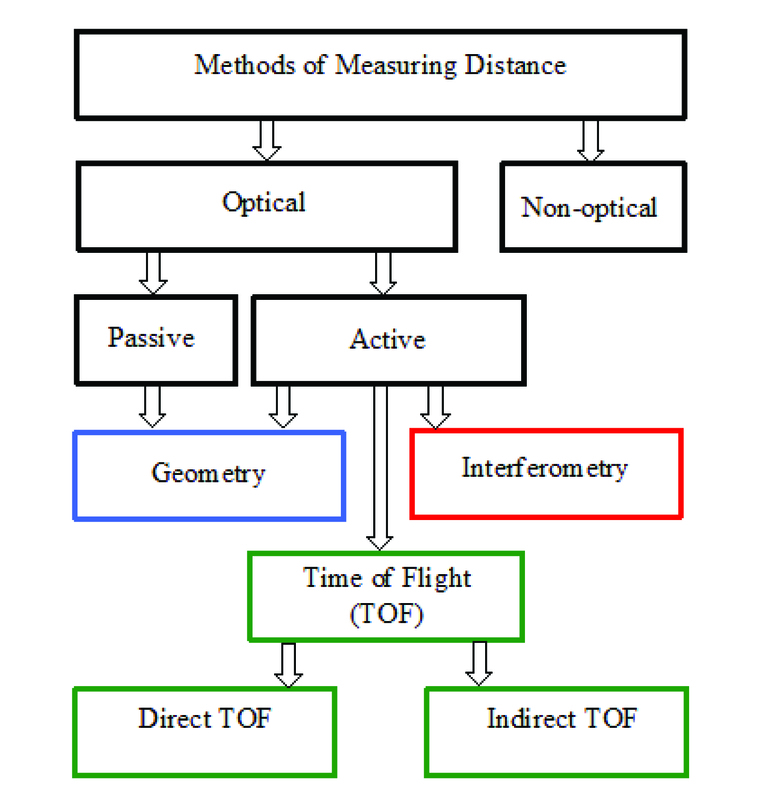 The ToF method depends on the finiteness of the speed of light and our ability to measure the ToF either directly with clocks (direct ToF) or indirectly (indirect ToF) by, for example, comparing the phase of the intensity-modulated emitted and reflected light. Interferometry relies on the wave nature of the light and the ability of waves to interfere. Optical distance measuring methods divide into two categories: passive and active. In a passive technique, the measuring system does not illuminate the target; instead, the light from the target is either reflected ambient light or the light produced by the target itself. In an active technique, the measuring system does illuminate the target. Depending on the technique, the illumination may be a combination of monochromatic, polychromatic, continuous, pulsed, modulated, structured, polarised, coherent or partly coherent light. Light detection and ranging (LIDAR) is a classic ToF system (both direct and indirect versions exist) for remote depth sensing. In direct ToF, the time jitter of the clock and the photodetectors limit the smallest measurable distance, whereas the intensity of the returned light limits the largest. In indirect ToF using pulsed illumination, other factors such as duration of the light pulses limit the minimum and maximum ranges. Computer stereovision is one notable application of passive triangulation. The system employs two CCD cameras positioned in the same plane and with the same orientation, and separated by a known baseline. Each camera simultaneously obtains an image of the target scene. Stereovision works well for flat scenes with high contrast, albeit at the cost of a great deal of computational power. For active triangulation, a laser illuminates a spot on the target and a line sensor, photodiode or APD array can determine the location of the spot on the image. If the target moves horizontally in a controlled way with respect to the laser beam (or, alternatively, the laser spot moves on a stationary object), measurements of distance to multiple points on the target can be made, which together provide a three-dimensional picture of the target. This is known as laser scanning. Point-by-point scanning is time consuming. A faster approach is to illuminate the target object with structured light, a single line or a pattern of lines and use a 2D image sensor to detect the reflected pattern. Fig. 2 illustrates the concept. In the left panel, the light projector casts a straight luminous line on the flat target. Here, the CCD image of the projection is also a straight line. In the right panel, the projected luminous line is comparable in size to the structural features of the target object (a cube, in this example). The image of the projection will not be a straight line (for most of the projector/camera configurations). 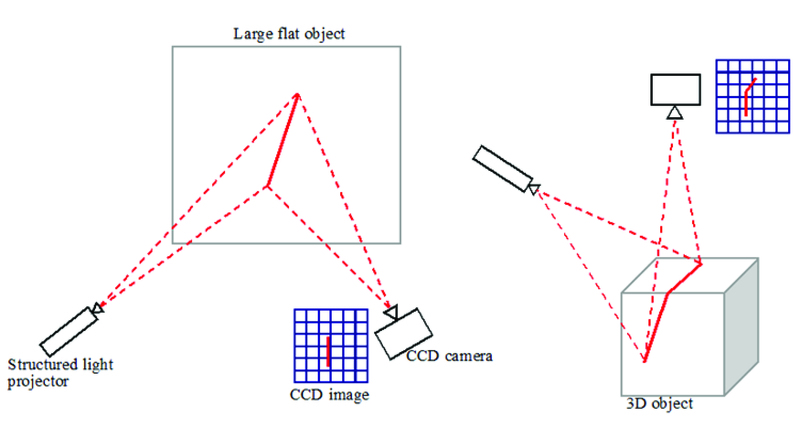 For the fixed projector/camera locations, the shape of the image depends on the shape of the object. A mathematical algorithm can be developed to deduce the shape of the target given the geometry of the input and imaged structured light. In practical applications of structured light, there are two approaches of generating the light. The first uses two wide-beam lasers whose light generates an interference pattern, free of geometrical distortions, on the target. By changing the angle between the two beams, a wide range of patterns with large optical depth can be generated. The implementation of this approach is difficult because the geometry of the interference pattern is very sensitive to the relative orientation of the two beams. Another disadvantage is high cost. The second arrangement of illumination, less expensive than the first, uses a video projector, which projects a luminous pattern from, for example, a liquid crystal display onto the target using lenses and mirrors. The tradeoff for the lower cost is a greater degree of geometrical distortions in the projected structured light and pixelated edges of the pattern if the image comes from a pixelated device such as a liquid crystal display. When analysing the data, the geometrical distortions introduced by the projector and the detection system must be corrected for, which makes the mathematical algorithm more complex. Practical applications of structured light are diverse, ranging from video gaming (Microsoft Kinect) to the fashion industry (made-to-measure apparel production) and forensics (finger print acquisition). Fig. 2: The concept of structured light approach of obtaining 3D information. One limitation of such measurement is a compromise between the frame rate and density of sampled points, which affects either the accuracy or the spatial resolution. 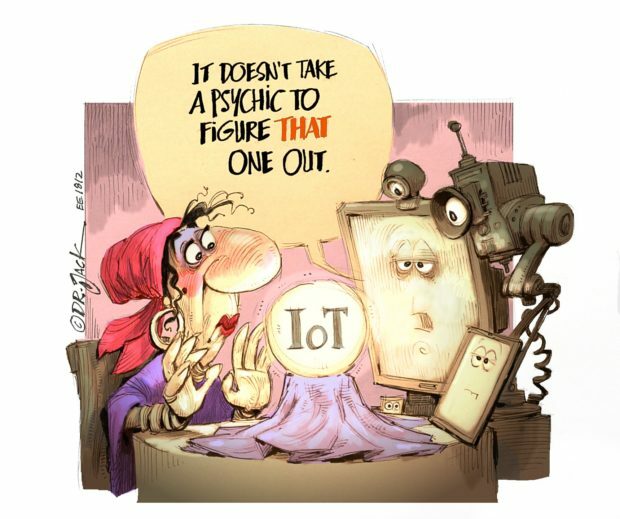 Therefore, the development of a ToF CMOS imaging array is a breakthrough for measuring distance, to lessen this compromise. The scene is illuminated with intensity-modulated or pulsed infrared light. The optics of the system creates an image of the scene onto the ToF CMOS array sensor. The distance is proportional to the phase shift.